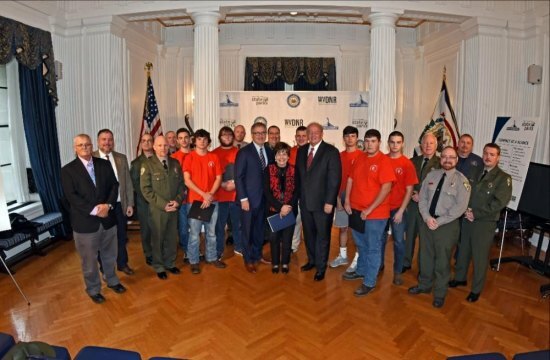 CHARLESTON, W.Va. — Officials from the West Virginia Department of Education and the West Virginia Division of Natural Resources today announced an interagency partnership which will enable students in Career and Technical Education programs across the state to gain authentic work experiences while helping to revitalize West Virginia’s state parks. Student-led companies, as part of the Simulated Workplace program, will utilize their technical skills at 35 state parks, seven state forests, the Greenbrier River Trail and the North Bend Rail Trail. More than 24,000 students within 1,200 Simulated Workplaces will complete a wide range of needed updates such as construction projects, repair of HVAC systems and restoration of bathhouses. Students will apply technical skills to enhance state parks throughout the Mountain State, many of which have not been updated for more than 30 years.